DIY has taken the challenge out of Do-It-Yourself. We have developed tools to guide you through every step and streamlined the process for a quicker installation. In your kit you will find a cardboard template, simply mark the holes where the template shows and drill. We even rent a drill alignment tool so your drillings will be on target every time. The fence and poles come preassembled, after drilling just stand the fence up, hook them together, and your done. VisiGuard pool fencing by Sentry Safety is made of synthetic fiberglass mesh which provides a durable barrier between your child and your pool. Additionally, the top border is lined with a UV protected coat which helps resist the harsh elements. Sentry Safety Pool Fence's innovative fencing solutions are known for their endurance and reliability. DIYPoolFence.com has taken the challenge out of Do-It-Yourself. We offer tools to guide you through every step and streamlined the process for a quicker installation. The VisiGuard pool fence kit includes a cardboard template: mark the holes where the template shows and drill. We also rent an exclusive drill, bit and drill guide. Finally, the fence and poles come pre-assembled; after drilling just stand the fence up, hook sections together and your done! DIYPoolFence.com understands that your pool area still plays an important roll in entertaining friends and family. VisiGuard pool fence is designed to set-up and take down in minutes. Simply unhook the fencing from the wall or other fence pieces to release the tension and take the poles out. It's simple, no tools are needed. Our plastic ground sleeves protect the fence poles from the wear and tear of repeated setups and take downs. Plus, they protect the feet of your family from the sharp edges of the holes while your fence is in the down position. Our exclusive drill, bit and drill guide package comes FREE for 3 days with your pool fence purchase of $500 or more. It can also be rented for 3 days for only $10. This complete drill kit takes the guess work out of drilling. 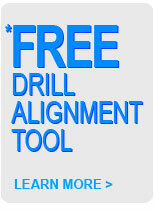 Now you can achieve the drilling angle you seek easily and effectively. Doing it yourself saves time and money. Don't rely on fitting into the busy schedule of a contractor or installation company. Install VisiGuard safety pool fence in your own timeframe. Also with all our exclusive tools guiding you, it is simpler than ever to do the install. With contractors constantly raising their installation prices, you can save up to 50% of the cost of hiring someone to do it for you. Just because it is Do-It-Yourself doesn't mean you are alone. We have an easily accessible installation page on our website, along with a digital copy of our manual. Seeking further assistance? Our technical support is available to help your pool fence installation process 7 days a week from 9 a.m.-9 p.m. Eastern Time 1-877-349-3362. DIYPoolFence.com and the Sentry Safety Pool Fence brand stands behind the quality of the VisiGuard product line. Therefore, VisiGuard pool fencing products comes with a manufacturer's lifetime warranty to give you peace of mind for the many swimming seasons ahead. According to government statistics from the *Centers for Disease Control and Prevention, approximately 30% of the children who died in 2005 from drowning were under 5 years of age. Additionally, "for every child who dies from drowning, another four received emergency department care for nonfatal submersion injuries." Among major risk factors a lack of barriers and supervision are cited. Therefore the CDC recommends that "barriers, such as pool fencing, can help prevent children from gaining access to the pool area without caregivers' awareness." DIYPoolFence.com offers fully assembled Sentry Safety VisiGuard Pool Fence to help protect toddlers, children and pets. With properly installed pool fencing, you can take control of a potential hazard on your property and guard your family from drowning risks. DIYPoolFence.com offers Sentry Safety Pool Fence: the leading Do-It-Yourself pool fence brand. Combining the quality of Sentry's VisiGuard product line with DIYPoolFence.com's affordable pricing, purchasing your in ground pool fence has never been easier or more affordable. VisiGuard child safety fence is one of the safest, easiest to install and most durable safety fences on the market. In the blink of an eye your child can leave your sight, but with the steel rod enforced poles, UV protected border and lifetime guaranteed pool fencing, VisiGuard will help you make sure that your pool is the one place your child can't go. Plus with VisiGuard's specialized all black background enhancing mesh so, your beautiful pool and patio won't loose any style or ambience. VisiGuard pool fencing by Sentry Safety Pool Fence is easy for the average homeowner to install because the mesh comes pre-assembled to the poles which helps dramatically streamline your installation time. Additionally, the pool fencing divided into easy to carry sections and comes with the necessary deck sleeves, caps and hooks and eyes. DIYPoolFence.com takes the ease of installation one step further by renting a complete drill, bit and drill guide package (per weekend). This alignment package is unlike anything available at the hardware store or from with other pool fence companies. It helps you drill every hole efficiently and at the desired angle. Safety fence installation takes only a few hours and last for years. *Each purchase over $500 automatically includes the FREE use of our exclusive drill, bit and drill guide package for one weekend!